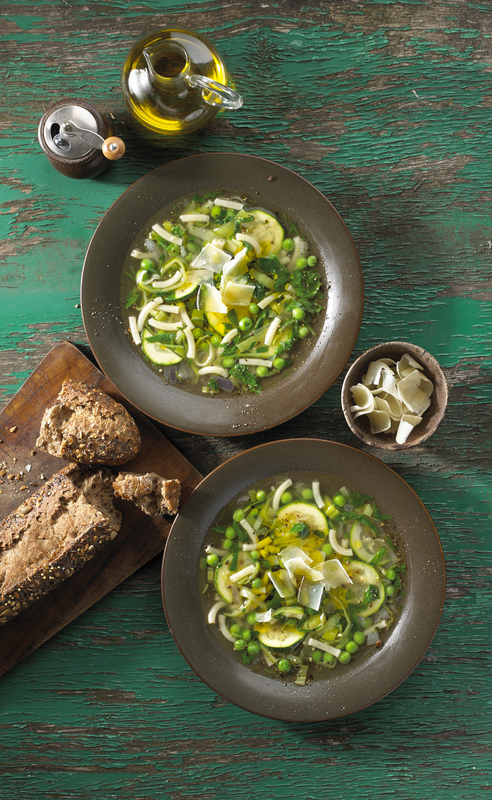 Green Minestrone Soup | Flavor Your Life. Heat the extra virgin olive oil in a large stockpot over medium heat. Add the onion and cook until soft without color. Add the garlic and stir quickly. Add the leeks and cook until they start to soften slightly. Add the stock and parsley.Raise the heat to high, bring to a boil. Once the soup has come to a boil, reduce the heat to medium-low and simmer covered for 20 minutes. While the soup simmers, cook the pasta according to package instructions and set aside. Add the zucchini and frozen peas to soup, simmer for 2 minutes. Add the spinach and simmer an additional 2 minutes. Remove from heat and add the cooked pasta. Salt and pepper to taste. To serve, divide into 4 bowls and drizzle with more extra virgin olive oil and some shaved Parmesan cheese.